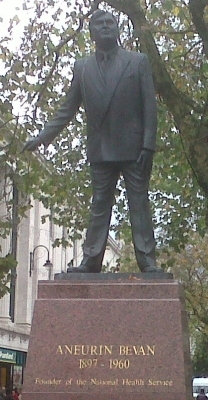 Wales’s greatest hero, Aneurin Bevan, died 55 years ago today of cancer, aged only 62. Born into a mining family in 1897, he experienced first-hand the problems of poverty and disease. A committed socialist and miners’ leader, Bevan was elected as the Labour Member of Parliament for Ebbw Vale in 1929. After the landslide Labour victory in the 1945 general election, Bevan was appointed minister of health, and became the architect of the National Health Service which was launched in July 1948, just 67 days before I became an NHS baby. In 1951, he resigned from his position as a Government Minister in protest at the introduction of prescription charges for dental care and spectacles and became a member of a very exclusive club – that of politicians with integrity. Indeed, he had been briefly expelled from the Labour Party on the eve of the Second World War for advocating a popular front. He was a difficult man to work with as he spoke his mind. Churchill called him a “squalid nuisance” and he repeatedly savaged the two leading Labour members of Churchill’s coalition cabinet, Ernest Bevin and Herbert Morrison. “In Place of Fear”, the title of Aneurin Bevan’s 1952 book stated that it was possible to create a society where all could live without fear of going hungry, being poorly housed, or of living with (or dying in) great pain. Sixty years later, the Conservatives are doing their best to destroy that Utopian dream which was well on the way to being achieved. It was not simply the introduction of the NHS in 1948 that halved inequalities in health in Britain between the 1930s and early 1950s. The overall improvement in living standards brought about by the introduction of the welfare state transformed people’s lives. The strongest correlate to poor health is poverty, and the longer people live in poverty the shorter lives they can expect to live. The Tory budget due in two days will continue to dismantle the good work done by Aneurin Bevan and his Labour Party, which was a genuine socialist party, unlike the anaemic, people-pleasing shadow of a party that it is today. The Tories have scrapped poverty targets, benefits will be cut and the poor will be even poorer. We need politicians like Aneurin Bevan today, who will ignore the focus groups, the media moguls and the opinion polls to care for the disadvantaged people of our society.